So I tried to recall the ingredients as best as I could and wrote them all down. And I successfully cooked a delicious chicken dinner, so I am pretty happy with my memory work. The amounts of each ingredient are not as important in this dish, so don’t fret over them too much (I certainly didn’t). It’s a great winter dish for a cold night, plus it’s basically a one pan meal, which makes cleaning up a breeze. Start cooking the barley – that will probably take about 45 minutes, just follow whatever it says on the box. 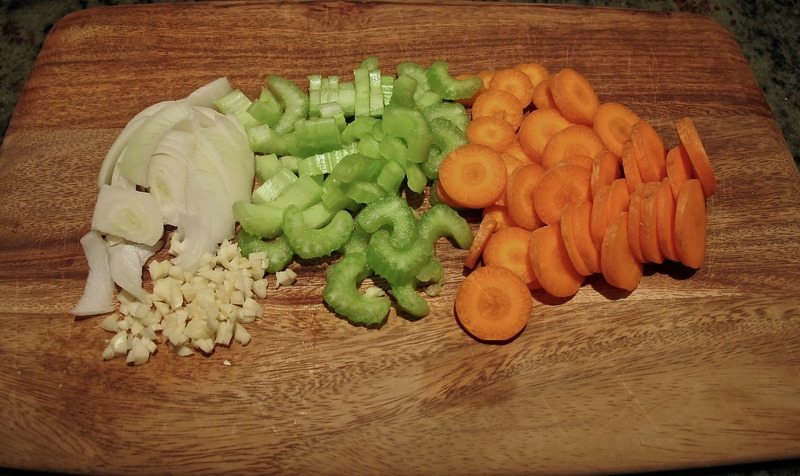 Chop up the carrots, onion, celery, and garlic. Set aside. Combine the chicken stock, white wine, Dijon mustard, and flour together and stir with a whisk. Set aside. Add the olive oil to a pan and heat to medium-high. Add the chicken into the pan and cook through, then set aside on a plate with aluminum foil over it to keep it warm. 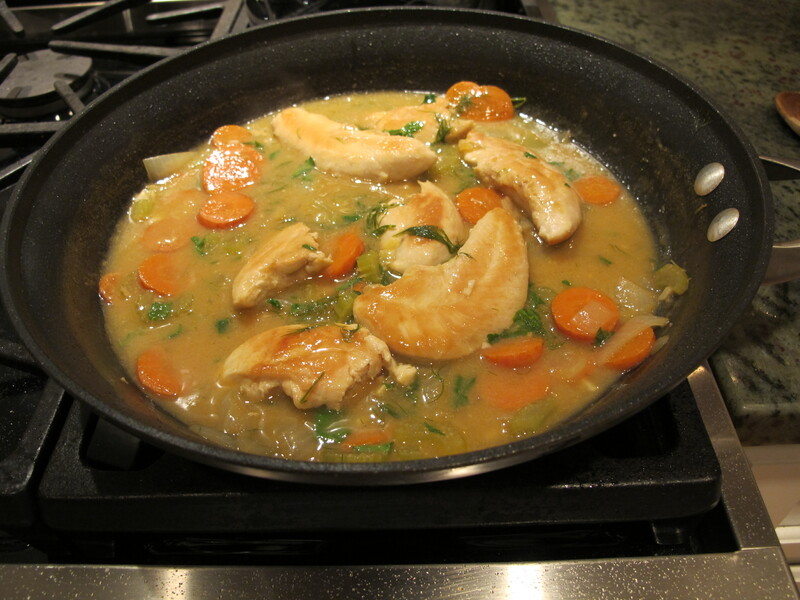 Using the same pan, add in the carrots, onion, celery, and garlic. Cook on medium heat until the onion is somewhat translucent, about 5 to 7 minutes. Add the liquid mix (chicken stock et al) to the pan, bring up the heat until it boils. Then turn the heat down slightly and let everything simmer until the broth is reduced somewhat. At this point, you can sort of choose how liquid-y you would like the sauce to be – I cooked it for about 10 minutes. Add the parsley and dill to the mix. Add the chicken back into the pan with everything to heat, covered, for about 2 minutes. You can add the barley into the mix at this point if you would like, or just serve the chicken and sauce over the barley. 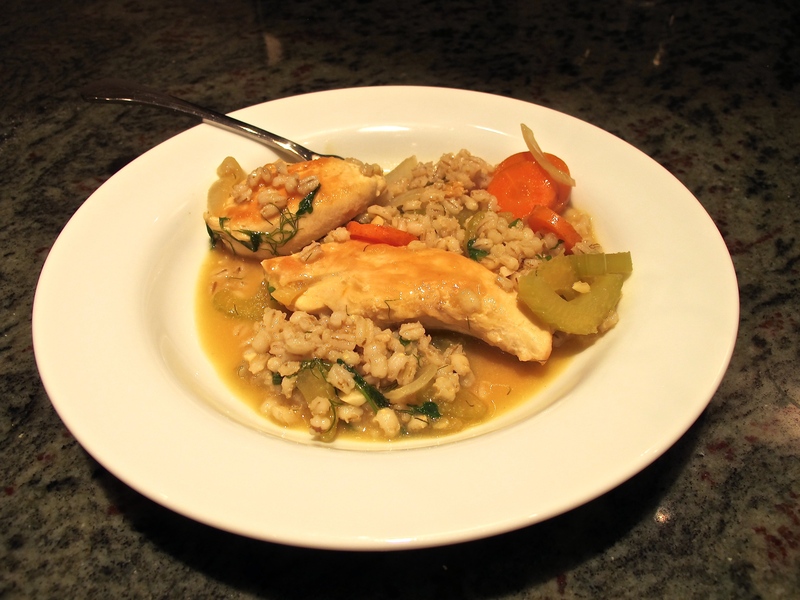 This entry was posted in Noms and tagged Barley, chicken, dill, mustard chicken with root vegetables, parsley. Bookmark the permalink.